Well, where to start. I could say that the DC-3 is the aircraft that started the revolution for safe airline travel, but that has been said before. 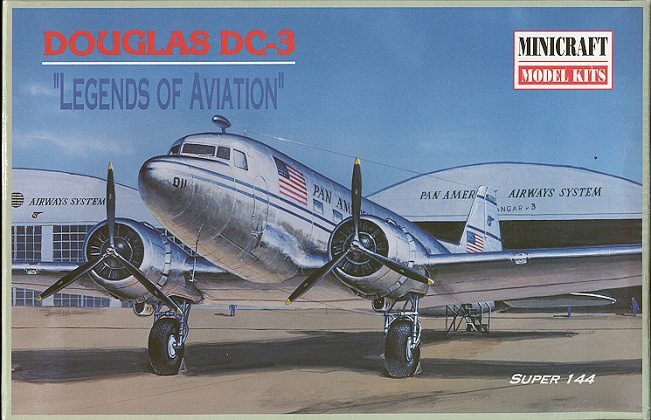 I could also say that the DC-3 put Douglas aircraft on the map, but that has been said before as well. Frankly, there is little that I can had to the millions of words in thousands of volumes that has been written on the DC-3 so I won't. 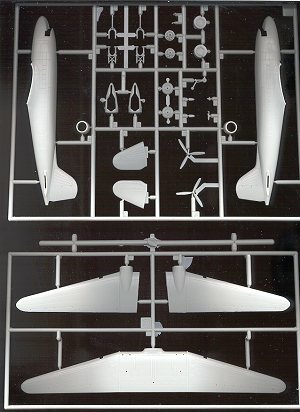 ...except to say that in modeling circles, there have been DC-3s in all sorts of scales; 1/48, 1/72, 1/100 and 1/200, but until Minicraft did this one, there has not been a kit in 1/144, the standard airliner scale! As one expects from a modern (1996) model kit, this Minicraft kit has it all. There are nicely engraved panel lines that don't look too bad and are a lot finer than you'll find on the Hasegawa 1/200 airliners, which is good. They are flash free and devoid of ejector pin marks in any embarrassing places where it would be difficult to remove them. It has clear bits for the windscreen and landing lights. There is no interior as frankly, it would be tough to see anything. 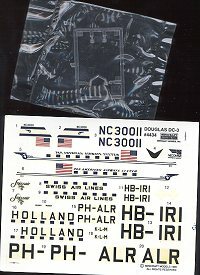 Cabin windows are represented on the decal sheet. If I had a concern, it would be the props. Both of mine were not perfectly formed, some of the blades being a bit 'wasp waisted' in that they were a bit slimmer in the middle of the blade. The instruction sheet is typical giving six construction steps in the usual manner of drawings for each step. With minimal parts and a simple paint scheme, the kit should be up and running in no time. The decal sheet offers three examples, two of them Pre-WW2 and one post war. First is a Pan American aircraft from 1941. This one is undoubtedly what most will choose here in the US as it has a pleasing scheme and nice big US flags on it to keep it from being shot down by the baddies in Europe. Next is a super orange KLM version from 1939. For those of you who are terrified of natural metal finished, this will be the one for you. Finally, a Swiss Air version from 1946. This one has a nice red tail tip to give it some color. While the sheet offers great examples, the sheet itself is a bit of a problem. Made by Necomisa in Mexico, it is very well done, but suffers from yellowing of the carrier film. This can be a real problem as this yellow film will not look good against natural metal and cutting out each letter is a real pain. Fortunately there are aftermarket sheets available for this kit. Should you get a good sheet, you will notice that the windows are included on each marking variation. I have used Necomisa decals before and found them to be very good indeed, except for the aforementioned yellowing problem. Overall a nice little kit (even if it is produced by God-less Communists), that should build rather quickly and look good on your shelf. One small thing. The tail fin looks a bit too round and could benefit from a bit of flattening after the fuselage is together. Review copy courtesy of me and my wallet! If you would like your product reviewed fairly and quickly by a site that has over 800 visits a day, please contact me or see other details in the Note to Contributors.